Want to know how much Golden Books rock? You remember Golden Books, don't you? 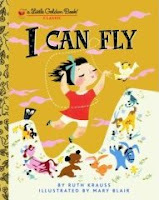 They made those classics from childhood: The Saggy Baggy Elephant, The Pokey Little Puppy, and so many more, including my favorite, I Can Fly, by the classic designer/animator Mary Blair. Recently I discovered that if you buy one of their collections of Golden Books, included in the pack is a blank Little Golden Book! When I discovered this, I immediately schemed to buy way too many of the packs just to get my hands on a few of these things. 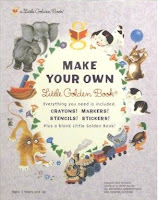 Then I saw the Make Your Own Little Golden Book! These are great--they come with crayons and markers, as well as stencils and stickers based on various licenced properties. When my daughter turned 5, we had a book party: Everyone came dressed as their favorite book character, brought their favorite book which we read in one big storytime, and we kicked off the party by handing out the Make Your Own Little Golden Books and having a bookmaking bash! Hey, what's up with our friend Elizabeth Dulemba? Guess Who's Coming to Little Shop of Stories? Do You Know Horn Book?